The United Nations Human Rights Day on December 10 ceremony will be dedicated to Malala Yousafzai at the United Nations Educational, Scientific, and Cultural Organisation (Unesco) headquarters in Paris. The organisation has decided to hold mega events on the occasion that will be attended by several world leaders including Pakistan’s President, French Prime Minister, former British Prime Minister Gordon Brown, Queen Rania of Jordan and Chilean President. They will pay tribute to the heroic and leadership role of Malala, who was attacked on October 9 in Swat and since then under treatment. Unesco has given title of “Stand up for Malala — Stand up for girls’ right to education!” to the event. The organisation has termed it as the rallying cry of an advocacy event and it is being organised by Unesco and the Government of Pakistan. French Premier Jean-Marc Ayrault will inaugurate the event. President Asif Zardari will visit Malala Yousafzai in Birmingham hospital before proceeding to Paris. She is admitted in the Birmingham hospital for treatment. Pakistan high commissioner in the United Kingdom Wajid Shamsul Hasan is trying very hard to take permission from the doctor for his President to be on bedside with Malala as her doctors didn’t allow any outside visitor, including British Foreign Secretary William Hague and Pakistan’s Interior Minister Rehman Malik, to meet her as the both reached the hospital but couldn’t get the permission by the doctors to visit her. 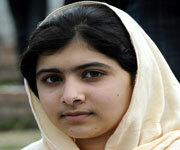 The parents, brothers and sister of Malala have so far been allowed to see her. The president will leave for London on Sunday next before moving to Paris. He will be staying in London for two days. It will be Asif Zardari’s fourth visit to France ever since becoming the head of the state four years ago. He will be visiting Turkey before returning home and attend trilateral summit of Pakistan, Turkey and Afghanistan in Ankara where the latest developments with regard to Afghanistan will come under discussion. Foreign Minister Ms Hina Rabani Khar may also join the President in London for accompanying him in the trip, the sources said. Unesco believes that the event at its headquarter will accelerate political action to ensure every girl’s right to go to school, and to advance girls’ education as an urgent priority for achieving ‘Education For All.’ The event pays tribute to Malala Yousafzai, an astonishingly brave 15 year old girl who survived an assassination attempt for her determined efforts to defend girls’ education in Pakistan after the Taliban outlawed schools for girls in her native Swat Valley. The human rights to education and gender equality were both violated by this action. “Whenever and wherever a young girl is forbidden from going to school, it’s an attack against all girls, against the right to learn, the right to live life to the full; and it is unacceptable,” declared Unesco Director-General Irina Bokova. Indeed, there is no justification – be it cultural, economic or social – for denying girls and women an education. Humanity stands as a single community when united around human rights and fundamental freedoms,’ she added. Unesco has emphasized that Malala’s struggle highlights a devastating reality: Girls make up the majority of the world’s one million out-of-school children. They are less likely than boys to enter primary school. Harmful practices such as early marriage, gender-based violence, discriminatory laws, prevent them from enrolling in or completing school. Educational disparities start at the youngest ages and continue into adulthood. Women represent two thirds of the world’s 775 million illiterates. Despite making breakthroughs in higher education, women still account for just 29 percent of researchers. There can be no equitable and just society without achieving gender equality, beginning with education. Unesco is committed to the full enrolment of girls, ensuring they stay in school from primary through secondary and on into higher education. Education accelerates political, economic and social transformation, giving girls the tools to shape the world according to their aspirations. It has a positive impact on child and maternal health, fertility rates, and poverty reduction. It is a life multiplier. For example, women with post-primary education are five times more likely than illiterate women to be knowledgeable about HIV/AIDS prevention. Malala’s passionate advocacy shows the power of aspirations for human rights to move history. Unesco’s event on 10 December draws strength from her example. There are no immovable barriers to gender equality and education for all. Browse All UNESCO World Heritage Sites in Pakistan. The original Source File!! !